You can probably tell which are the base oils that make up the whole. There are many types of oils in the market – jojoba oil, Argan oil, sweet almond oil, grape seed oil, castor oil. Beard oils not only take cares of your beards but also take cares of your facial skin. The external and initial action of a beard oil is, it hydrates, softens, produces a great nice shine and sheen to the beards. Overall, beard oil promotes the real healthy growth of your beards. We listed some beard oils for you which would be great for your beard, skin health and fashion. Why Beard Oil is So Essential? Here I want to say some benefits of using beard oil in brief. So let’s start. A beard oil removes the dryness of beard and itching. Regular use of beard oil, reduce dandruff gradually. Continuously using of a good beard oil, helps to grow the patchy hairs. Maintaining and styling will be easy. Beard oil serves an amazing fragrance and provides refreshing feelings. Beard oil removes the acne reduce the burning of the skin. Honest Amish has a reputation for hand making and for their classic grooming products. They started with beard balm firstly and achieved people’s trust and acceptance very soon. Then they launched their most popular beard oil Honest Amish Classic Beard Oil. This oil captured the market quickly and currently one of the top-selling beard oils on the market. The Honest Amish Classic beard oil contains a jojoba oil base which is a common ingredient in a beard product. Jojoba nearly has become like human skin serum for that it is common in hair and skin products. The ‘’Avocado oil’’ delivers important nutrients to your hair and skin, And the Honest Amish Beard oil also contains this ingredient. The Virgin Argan and sweet almond oil both ingredients will help the texture as well as the moisturizing outcome of the blend. This oil also contains 2 standout ingredients and they are Moringa and coconut oil. And these ingredients I did not see to use any beard oil. The Moringa oil fights with the bums/rashes/aging/wrinkles/ blackheads and bead dandruff and provides you a healthy beard. The coconut oil reduces the itchiness of beards and it is a common problem of most of the men. All these amazing stuff are neatly packaged in a small 2 fluid ounce bottle. The bottle is designed with a dropper lid which will make easy to use in a hurry. I bought this beard oil recently. You need to be careful with the amount of oil you apply because with the wrong amount it may feel a little bit heavy or light. This happened to me when I used it for the first time. It made my beard heavy and I don’t like that feeling. After a few times of uses, I understood the right amount. Only a couple of drops of oil is perfect for my beard. This oil is not greasy and it expands all over the beard without using a comb. There is nothing to complain here at all. 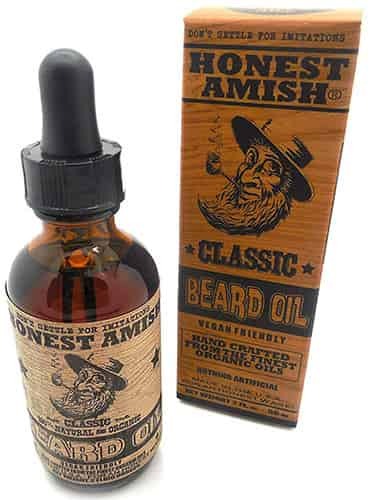 This ‘’Honest Amish Beard oil is really one of the best hair oils and it is well priced but effective. The smell is pleasing but it remains in the background as well as doesn’t overpower your sense. This beard oil contains all the essential oils and it will not clog your pores. After applying a couple drops of oil, your hair will look shiny. I think this Oil Brand has lived up to its reputation as well as provided a great product. I will highly recommend to all beardsman who demand to grow a glorious beard. 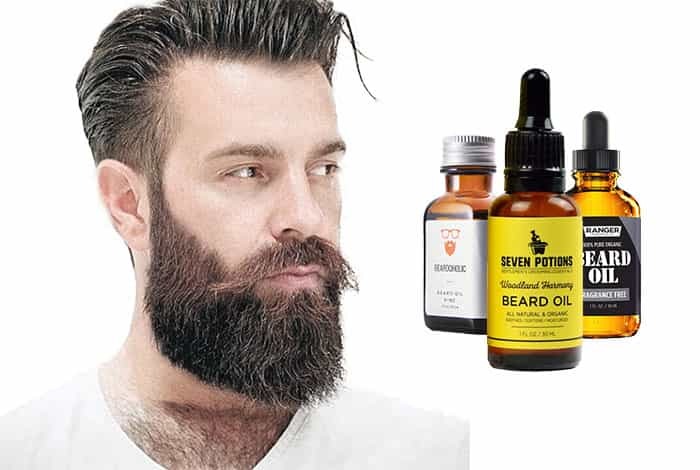 The Woodland Harmony beard oil is produced by “Seven Options(brand)”. The oil contains jojoba oil which constitutes both Vitamin A and Vitamin E.
Vitamin A provides strong skin and Vitamin E fights free radicals; typically, protects the skin from the sun’s ultraviolet rays. Vitamin E also moisturizes your skin and hairs to make the hairs strong and lively. It contains antibacterial and antifungal features. The beard oil contains Almond oil which works as a cleanser. Because it removes any grime or dirt that establishes follicles of the beard hair. The Apricot Kernel oil will make the skin smooth and soft and it will also moisturize the hair and provide you a soft beard. This oil contains fatty acids which will make the beard shiny and smother and more humble. The Crambe seed oil will improve the look of the hair along with yielding some strength. The Aloe Vera works as anti-fungal as well as anti-bacterial agent and serves moisturizer. It also boosts in promoting beard growth. Sandalwood and the cedar wood both are comprised in this oil primarily for the scent they deliver. But they have other features too. The sandalwood fights against dandruff and raises the hair growing speed. It also makes the skin soft. The moisturizing / anti-fungal / anti-bacterial features along with the soften feature of these ingredients in Woodland Harmony will reduce the itching of the beard hair. 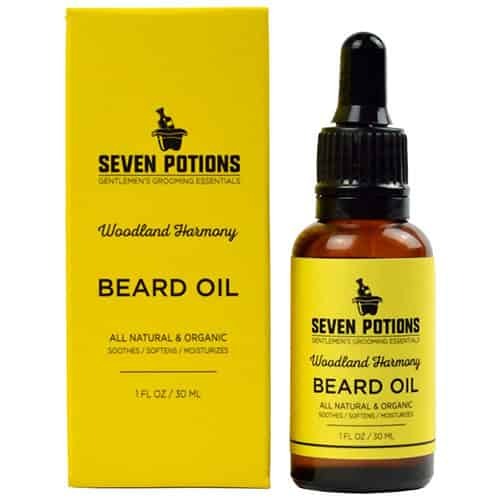 Woodland Harmony by Seven Options is a high-quality beard oil which made with all 100% natural oils. So there is very little adverse reactions and side effects. The sandalwood and cedarwood are the keys of all these ingredients which will help to provide a pleasant scent. This beard oil also prevents the common problem of beard ‘’itching’’. One of the great features of this beard oil is – it will prevent split ends and it is quickly absorbed in beard which feels shiny, not greasy. The anti-fungal agent will help to protect the skin from any infection and provide you a rapid hair growth. All the ingredients of this beard oil also work as anti-oxidants prevent the skin from aging. 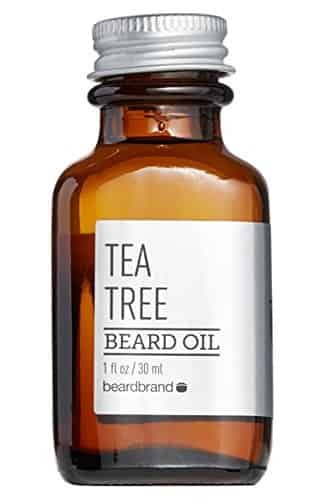 The Beard Brand Tea Tree beard oil provides you a soft beard hair for that, styling the beards will be easy and effortless. Generally, rough beard itches, so by using this beard oil, you can permanently suppress all that beard itching. Sweet almond oil and Aloe Vera. This beard oil contains jojoba oil and this ingredient is not only for smoothness of the skin it has also anti-bacterial as well as anti-inflammatory features. Vitamin A and E will help to reduce acne and other skin problems. These ingredients will provide you considerable escape from them. Vitamin A supports to make the skin firmer and youthful. The almond oil works as a cleanser and removes all type of dirt from the beard. Crambe seed oil is for recovering collagen, it moisturizes the skin as well as reduces the acne. It also prevents sunburn causing skin damages. Vitamin E, proteins, minerals, fatty acids are derived from castor oil. These ingredients make the oil anti-fungal and anti-bacterial. Castor oil also makes the skin smoother and softer. Glycerin moisturizes the skin and clogs wrinkles. This element is also workable against skin infections as well as best for the oily skin. This beard oil contains many elements to take good care of your skin and beard hair. All the natural elements provide this oil a unique scent. The fatty acid is also found in this beard oil. This tea tree beard oil helps to provide a shiny look of your beard. All the ingredients are natural. It is a ‘’grease free’’ oil, so you will never feel a greasy beard. Reduce the itching and dandruff. Nice smell and effective result. Provides soothes and soft beard and skin. Castor oil and pure essential oil. 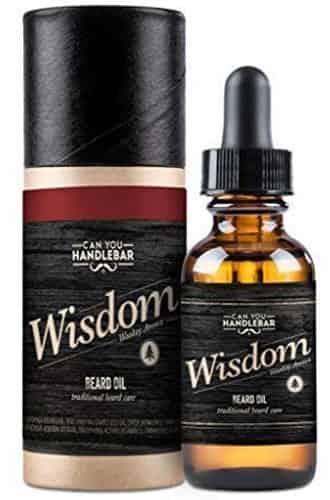 This is a top rated beard oil on the market. Almond oil works as a cleanser and removes anything blocking the follicles for breathing freely. This element is very workable for skin health and this Smooth Viking beard oil contains the base oil Almond oil. The cleanser helps the skin to stay healthy and also fight with the infections. The oil contains Vitamin A which is for firm skin. The castor oil provides a shiny and smooth appearance of hair because this oil is rich in fatty acids. The proteins also found in the castor oil which helps the hair to grow rapidly and repair the damaged hair. Ricinoleic acid is available in this oil which works against the bacterial and fungal infections. This element also reduces the skin itching and provides a hygienic beard. Vitamin E works like antioxidants and it helps to repair the skin. So this ingredient is good for both hair and skin because it protects them from the sun’s harmful ray. It also creates a smooth beard and skin too. Argan oil helps to prolong the beard growth and this ingredient is also found in the Smooth Viking beard oil. Avocado oil creates softer hair and increases hair growth. Essential oils are also available in this beard oil for their fragrance along with other beneficial features like – fatty acids/minerals/ vitamins. Shea butter is a multi-purpose ingredient, it works like a skin moisturizer, reduce the wrinkle because of the acids. This agent also prevents burnings. Mango butter enhances the rate at which the beard grows. Beeswax is for a smooth and shiny look so desired by fashion conscious people. The Smooth Viking beard oil is one of the best beard oil in the present market because of all these natural ingredients. This oil will provide a smooth and soft beard and enhance the hair growth rapidly. It creates a softer beard with the beeswax. This beard oil removes dandruff if you use it regularly. This oil moisturizes the skin. Using this beard oil also prevent your skin from sunburns, fungal infections, and acne. The sweet almond oil also fights against the burnings too. This beard oil is considered the top-selling beard oil and it is produced by the famous brand Leven Rose. The producer promises to take care of the beards with a great look. This Leven rose fragrance-free beard oil is anti-itching, it also has several features and benefits. It works as a moisturizer of the skin and beard and also removes the itching and dandruff. To get the best result, use it regularly. This beard oil contains only 2 ingredients- jojoba oil and Moroccan Argan oil. There is no fillers and scents. It is very light oil and removes the dryness of beard. Remove itching and dandruff permanently from the beard. Using is very easy and long-lasting benefits. Beardoholic is a very famous brand for beard grooming products. They have 3 special beard oils for maintaining healthy and amazing beards. The Beardoholic beard oil will liberate with all the infuriating itching and boost to tame down the beard. This beard oil also has many benefits and it is 100% natural. Being natural, it is very suitable for sensitive skin. This beard oil contains ‘’wheat germ oil’’. This ingredient has lots of benefits and high nutritional value. This oil works as an antioxidant and anti-aging agent which minimize bad cholesterol, repair tissues, boost energy, prevent skin problems and promote blood sugar level. The Beardoholic beard oil also contains pine fragrance oil. This base oil also has a lot of benefits and one of the most important benefits is, it works against various skin problems – itching/pimples/eczema/skin diseases / poor skin. This oil provides a smooth, renewed, balanced and shiny skin and hairs. All the natural ingredients provide it an amazing masculine scent. This beard oil contains Morocco Argan oil. The oil derived from Morocco and this Argan tree is their native tree. This oil is highly beneficial for skin and hair. This oil is enriched with Vitamin E and Vitamin E help to keep your skin youthful. Like I said, this oil is very effective for dry skin. This beard oil also contains ‘’Spinosa oil’’ and this ingredient works as a moisturizer. It also serves as a hair conditioner and styling agent. This oil hydrates the skin and helps to remove acne. This beard oil has been blended with ‘’olive oil’’. Olive oil is derived from the olive. It is a very useful ingredient all over the cosmetic world. Olive oil works as a moisturizer and improves skin health. It also makes hair soft and smooth. This beard oil also contains ‘’grape seed oil’’ which is a byproduct of winemaking. After making of wine by pressing the grape, the seeds are used for making oil. And this oil is so much beneficial for the skin and hair. It moisturizes the skin, prevents acne, skin rashes, lightweight. It also prevents the hair fall. The ‘’Apricot oil’’ reduce the hair damage and improves hair health. It also moisturizes the skin. The ‘’essential oils’’ serves amazing fragrance. So this beard oil has been blended with all natural ingredients with fewer side effects.